Mineral King is one of the least visited parts of Sequoia/Kings Canyon National Park, tucked away east of Fresno at the end of a serpentine road. 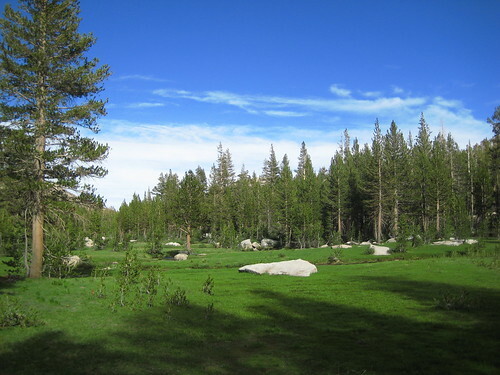 From Three Rivers CA, you drive 23 miles — and most of an hour — gaining 6,000 feet to a parking area in alpine meadows. (The parking lot looks like an auto-show. Everyone's hoods are propped up to keep marmots from getting trapped inside and wrecking the engine). For the 4th of July weekend, our 30 mile loop took us over the Great Western Divide twice, over two high mountain passes, through meadows with braided streams, past remote lakes and nonstop views. The meadow pictured above was so surreal, it looked like some kind of manicured golf course. 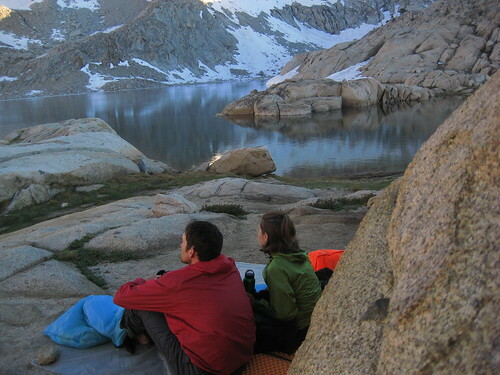 On the second day, we stopped by 2pm so we could set up camp and take it easy by an alpine lake. We took in the evening light show with some hot chocolate, and then directed our attention to the sky for the stars to emerge. 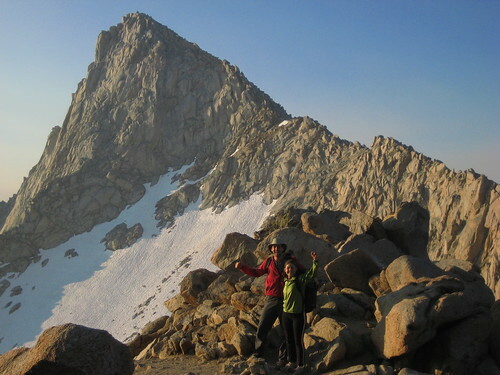 Our final climb was 11,630' Sawtooth Pass. The morning light was unusual and then we began to smell forest fires burning to the east. 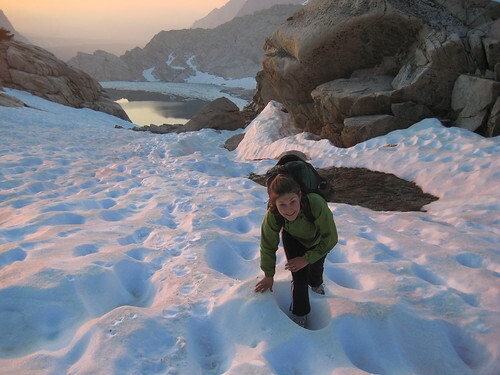 We only met a few other backpackers out there, and camped in areas out of reach of mosquitoes. A holiday weekend well spent. In the 1960s, the area was going to be made into a 'Second Tahoe' ski resort developed by Disney. Fortunately it remains mostly inaccessible and pristine today. 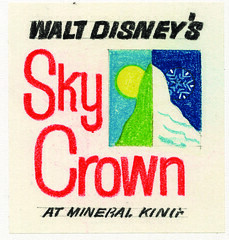 Here are some more details about the scrapped project and other vintage Sky Crown logo concepts. And if you need a real-time vacation, here's a link to the Mineral King webcam. Oh you guys, I miss you so much! 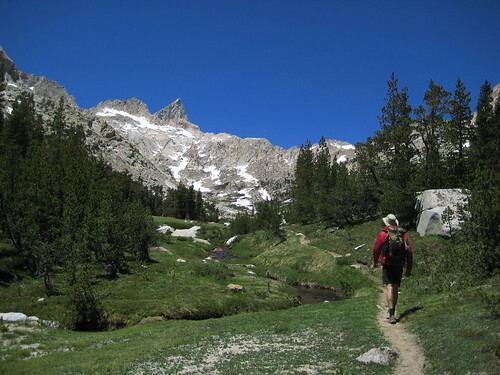 Your recent trip to Mineral King looks fantastic - Makes me want to hike the John Muir Trail all over again with you guys. You look great! Josh is in Boone, NC for his job and I'm stuck here in Madison finishing up mine. Wish we could be out there to start the PCT with you soon, I feel it's further away than I'd like. Lots of love to you both! Nice pictures--you have a good eye for photography. And, of course, such a beautiful place. I've been blessed to have a 54-year love affair with the Mineral King valley. 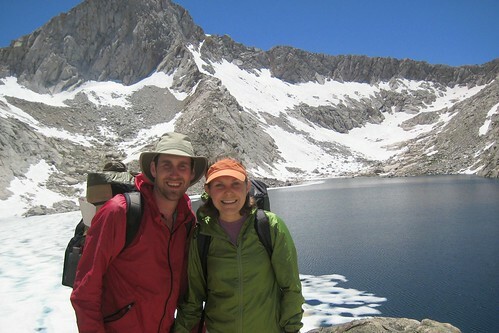 Oh, and if you want a nice challenge with a breath-taking ending, try Eagle Lake next time!